Pyramids Bar, Rooftop of Nile Hilton, 1113 Corniche El Nil , Cairo 12344. +20 2 578 0444 This rooftop bar is nowhere near as high as the neighbouring Ramses Hilton and therefore not as soaring as the Windows on the World bar and lacking views of the Pyramids. Terrace on 9, Radisson Blu Hotel, Abdel Hamid Badawy St, 114 Rawda Al Sheraton, Heliopolis, Cairo, Egypt. + 20 2 26 96 5656 A variety of snacks and light meals as well as refreshing drinks, including juices. Pool. 10am-10pm daily. Rooftop poolside sky bar, 25th floor, Fairmont Nile City, Nile City Towers, 2005 B, Corniche El Nil, Ramlet Beaulac, Cairo, Egypt 2466. Toll Free: 1 888 310 2323 On the banks of the famed Nile River. Daily 10am-6pm. Cafe, 15th floor, Everest Hotel, Midan Rameses, 6 Ramsis Sq., Above Banque Misr, Downtown, Cairo. +20 2 2 574 2506 Great views, 24 hr, nr Ramses Station not far from Tahrir Square st there? Odean Palace Hotel Coffee Shop, 6 Sharia Abdel Hamid Said, Cairo. ROOFTOP 24 hrs bar. Odeon Palace rooftop cafe off Talaat Harb. Four Seasons Pool Grill, 5th floor, 1089 Corniche El Nil, Maglis El Shaab, Garden City, Cairo 11519. On couches with your own plasma TV outside overlooking the pool. Impressive. Daily 8am-12 midnight. Continental breakfast 8am-11.30am. Lunch 11.30am-6.30pm. Dinner 6.30pm-12 midnight. Aura Restaurant, 4th floor, Four Seasons at First Residence, Cairo. +20 2 3567 1600 Gracious sanctuary on the west bank of the Nile, with impressive views of the Great Pyramids over the old-growth canopy. Daily 8am-1am. Nomad Bar, King Hotel, 20 Abdel-Rehim Sabry Street, Dokki Dokki, Cairo. 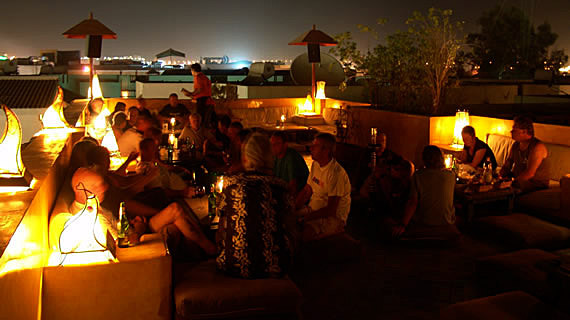 +20 2 335 0869 One of the most pleasant and affordable rooftop bars or lounges in Cairo. The Roof Garden, Karvin Hotel, 11 Mohamed Ebeid St, El-saba'a Emarat Square, Cairo 11341, Egypt. +20 2 2690 6453 open air Terrace serving a large variety of beverages. Khan El Khalili, Mena House Oberoi, Cafe-of-the-world, 24 hours restaurant, offering choice of continental and oriental cuisine, overlooking the Pyramids. Also Sultan Lounge. Enjoy cocktails with a panoramic view of the Pyramids. Royalmanta, 36th floor, Cairo. on the west bank of the Nile with impressive views of the Great pyramids .... with belly dancer and wonderful view ? Jayda Lounge and Bar, The Conrad Cairo, 1191 Corniche El Nil, Cairo, 11221. +20 2 2580 8000 1pm-12 midnight. Lunch, Dinner (based on weather conditions). Stage One Lounge and Bar, The Conrad Cairo, 1191 Corniche El Nil, Cairo, 11221. +20 2 2580 8000 Views of the city and the River Nile. Daily 5pm-3am. Located in the heart of Cairo and standing impressively above the River Nile, affording spectacular views. Daily 1pm-11pm. Le Clovis, Sofitel Cairo Maadi Towers and Casino, Cornish El Nil, Maadi, Po Box 217, Cairo 11431. Minutes from the city's most fascinating sites & ancient wonders. Panoramic views of the Giza pyramids. Jazz piano plays to panoramic views of the Nile. 6pm-4am. Pool and Lounge Bar, Sofitel Cairo Maadi Towers and Casino, Cornish El Nil, Maadi, Po Box 217, Cairo 11431. 7am-10pm. Citadel View, Sharia Salah Salem, +20 2 2510 9151 12 noon-12midnight. In Azhar Park in the Islamic Centre. Gorgeous multilevel terrace with great city views. Delta Pyramids Hotel, King Faisal Road. With basic facilities and an imposing high rise facade, this is not the most beautiful place to stay. But its reasonable rates and views of the pyramids from the rooftop patio make it popular with those on a smaller budget. The Cairo Tower, El Hadeka El Zahreya St. El Gezirah El Wosta. 360 Revolving restaurant At Zamalek district. El Borg Rooftop restaurant, Novatel Cairo, 3 Saray El Gezirah, Zamalek, Cairo. The restaurant serves a range of international cuisine and has a ‘dry’ bar. Spectacular views over Nile and City. Sofra. The name means 'dining table' and is synonymous with Egyptian generosity and hospitality. Located quite a way back from Luxor temple (walking away from the Nile) at the far end of Mohamed Farid street, Sofra is set in 1930's Egyptian house with traditional decor - antique oriental furniture, colourful copper lamps and beautiful mirrors. You can eat inside or outside, or on the roof terrace or patio. 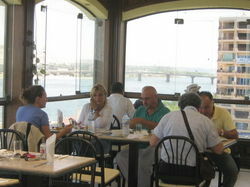 Studio Misr restaurant at Al Azhar Park. Senmut Band B Ramieh, ROOFTOP restaurant overlooks river ? My Egypt, El Tod, 095 206 0787, www.myegypt.co.uk ROOFTOP Restaurant. Delta Pyramids Hotel, King Faisal Road,. With basic facilities and an imposing high rise facade, this is not the most beautiful place to stay. But its reasonable rates and views of the pyramids from the rooftop patio make it popular with those on a smaller budget. Ali Baba, A small rooftop cafe overlooking the Temple of Luxor. El Nakhil. A great rooftop restaurant. Marhaba, Sharia el-Karnak, East Bank, Luxor. This rooftop restaurant above the main tourist market serves a decent mix of Egyptian and Mediterranean dishes against a panorama that takes in the Temple of Luxor, the Nile, and the Theban Hills. Tutankhamun Rooftop Bistro/Restaurant, Luxor. Rooftop bistro with a Nile view, south of the ferry landing. Best restaurant on the West Bank is the rooftop Tutankhamun Restaurant just a few hundred metres from the local ferry. Nile Valley Hotel, Gesirat El Bairat, El Bairat El Gezira, Luxor, Egypt +20 95 2311 477 Has a superb rooftop restaurant where the views are astounding including Luxor Temple lit up, 8am-11pm. Nefertiti Hotel Rooftop. Floodlit Thebes and the Nile. fd? El-Mesala Hotel. Rooftop view of Nile and Luxor Temple. fd? Grand Rotana Resort And Spa. Nightlife- enjoy the Sky bar on the rooftop. 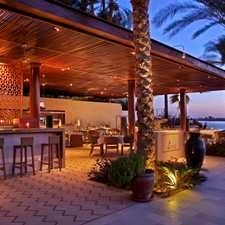 Grand Rotana Resort & Spa, Grand Rotana Resort And Spa, Nightlife. Sky bar on the rooftop. Red Sea I, Hospital St, Ed-Dahar, +20 65 354 9630 ROOFTOP Terraceniche, Ed-Dahar, ROOFTOP drinks good views Hurgata. Juke Box Pub, Corniche, Ed-Dahar, Rooftop drinks with good views. Paradise Inn, Windsor Palace Hotel, Alexandria. roof terrace cafe has one of the most wonderful views from their roof terrace cafe and restaurant. They have a prime location by the Corniche. Le Jardin, Steigenberger Cecil Hotel, Midan (square), 16 Saad Zaghloul Square, Cairo 1726. +20 3 487 7173. This 24-hour café offers a breathtaking, panoramic view of the Corniche waterfront promenade. A classy reminder of the city's history. Kenouz ROOFTOP restaurant,Shali Lodge, Sharia Subukha, 046 460 1299. Roof Terrace cafe/Restaurant. Al-Babinshal Restaurant, Al Babinshal Hotel, Sweeping romantic views over Siw. Nesima Restaurant, Al-Mashraba, Dahab Rooftop bar. Taba Heights is a relatively new development of five luxury hotels situated along the Red Sea in the northeastern corner of the Sinai Peninsula, about 20 kilometers south of Taba. This is an ultramodern, self-sufficient resort community with a golf course, marina and a mriad of activities and relaxation options. Marriott, Taba Heights, Taba 46621, Egypt. Taba Sands ,Nuweiba Road KM1, 99999 Taba, Egypt. Hyatt Regency, Taba Heights Km 20, Taba Nuweibaa Rd. Taba Heights, Taba Heights, Taba 46621, Egypt. InterContinental, Taba Heights P.O.Box 10 Taba Heights, Taba Heights, Taba, Egypt. Restaurant terraces. Try not to sit with your legs crossed as showing the sole of your shoe can be considered an insult. Aladdin Restaurant, Sofitel, Taba Heights, Km 42 Nubai, Taba Heights, Taba, Egypt. Relax on the outdoor terrace with sweeping views of the Red Sea shore and pool. Tam Tam, Hotel Gazala, 069 360 0155, ROOFTOP seating great Tam Tam Hotel, Ghazala. +20 6 9360 0155 Tasty Egyptian food near the beach with rooftop seating and great views, plus a front lounge with low tables, rugs and cushions to sit on at the front. Excellent karkaday, lentil soup and Egyptian sweets; also shawarmas and koftas. Does takeaway. Twice a week there's also an Egyptian floor show. Opening time: Daily until 1am. New Palace Hotel, 17, Soliman El Halaby st, Off Emad El Din St, +20 2 02 2575 1283 +20 2 2575 1322 Friendly staff, breakfast included, internet and printer access, free WiFi, rooms with bathroom and AC. 24h/day rooftop restaurant with a peaceful atmosphere. Odeon, 6 Abdel Hamid Said St, Odeon Palace Hotel, off Tala'at Harb St, +20 2 767 971 24 hours. This roof-top open-air hotel bar is also a restaurant, but most visitors prefer just to drink or have shisha. Beer (Stella or Saqqara) is 10 EP. Very popular among backpackers and foreign students. Open during Ramadan. Nice place to sit and have a drink, but poor service.